There are countless reasons I love Pinterest, one being the overwhelming collection of recipes I have saved to try for later! This particular soup has been tempting me with it's deliciousness for a couple of weeks and I was determined to try it out last week. Who even knew that Paula Deen's boys had such a knack for cooking? 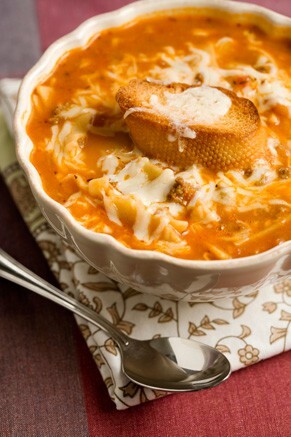 Let me just say that it just may be my favorite way to eat lasagna-EVER! It oozes flavor, and a plus, is much healthier than anything I've ever seen Paula make:) I wouldn't change a single thing about this recipe, and that is saying a lot!! And please, whatever you do-DO NOT skip the fresh basil, as it makes all the difference for this recipe!